Spinal Trap: Back 2 Good - Be Grateful, Be Well! Adopt an Attitude of Gratitude! You can't be well, when you are ungrateful. trying to keep your eyes open when you sneeze, impossible. trouble makers, drama kings and queens. efforts that lead to real progress. and by default, you will be well. because life has far more small moments than big. Be Grateful for the rain, the sun, the moon and the stars. Be Grateful for the endless array of beautiful flowers and plants. Be Grateful for the loyalty and love of dogs and all precious pets. Be Grateful for good food and even more so for good friends. Be Grateful for beautiful songs that make you feel love. Be Grateful for rainbows that are a promise from God. Be Grateful for God who always keeps His promises. and slowed you down, they may have just saved your life. Most of all, Be Grateful for good health. please click this link for more details, pricing or to book a session. to be as affordable as possible to help as many as possible. I love Max Lucado's story in the link below. I've read it and referenced it so many times, that its spine is as messed up as mine...nothing funny about pain and injury; but to laugh about anything is always far healthier than self-pity. 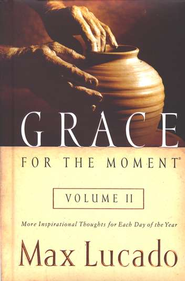 Interestingly, as I grow and learn from all that my injuries and chronic pain have challenged me with for over 10 years now, I recently realized that the passages from this book that used to be my most helpful during the early years in which I was on multiple Rx's as the rule, and had no peace by default, have changed, as I have changed and grown in my faith.